New Delhi: It will be a fight to finish, with cities nationwide, competing for the top honours in this year’s Swachh Survekshan, an annual survey of urban Indian cities based on their ‘swachh’ quotient, the national capital of Delhi is making an all-out effort to make an impression in this year’s survey. 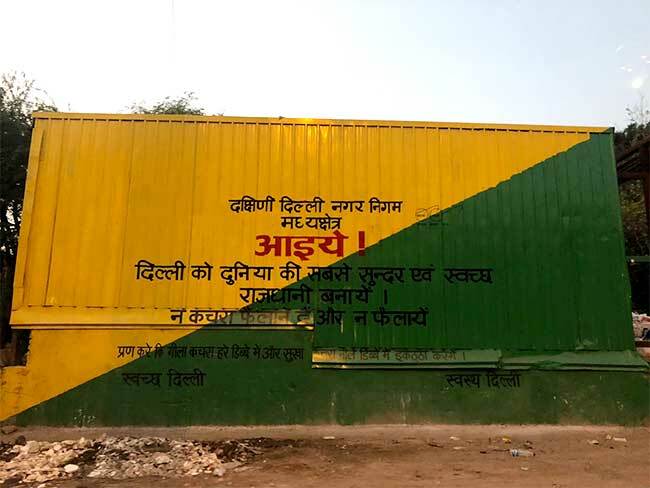 Delhi is not only attempting a beautification or decoration of the city but is looking for a sustainable transformation by generating awareness. In the past, barring New Delhi Municipal Corporation (NDMC), the other three Delhi municipalities have fared poorly in the previous years’ survey. NDMC is the only ODF area in Delhi. An official from East Delhi Municipal Corporation believes that the huge population is to be blamed for the poor scores. Delhi is the fifth most populous city in the world with an estimated one crore and eighty lakh people residing in the capital as of 2016, making it difficult to implement measures and attain the goals set by the Swachh Bharat Abhiyan. So how different will this year be? Will Delhi surprise everyone or capital’s woes as far as Swachh Bharat Abhiyan is concerned, continue? South Delhi includes residential as well as commercial areas like Greater Kailash, Saket, Lajpat Nagar, Dwarka, Hauz Khas Village, among others. South Delhi Municipal Corporation (SDMC) was ranked 32 in 2018, when 4,203 cities were surveyed. 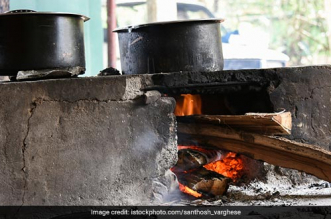 For this year’s Swachh Survekshan, the municipal corporation has stepped up its efforts. 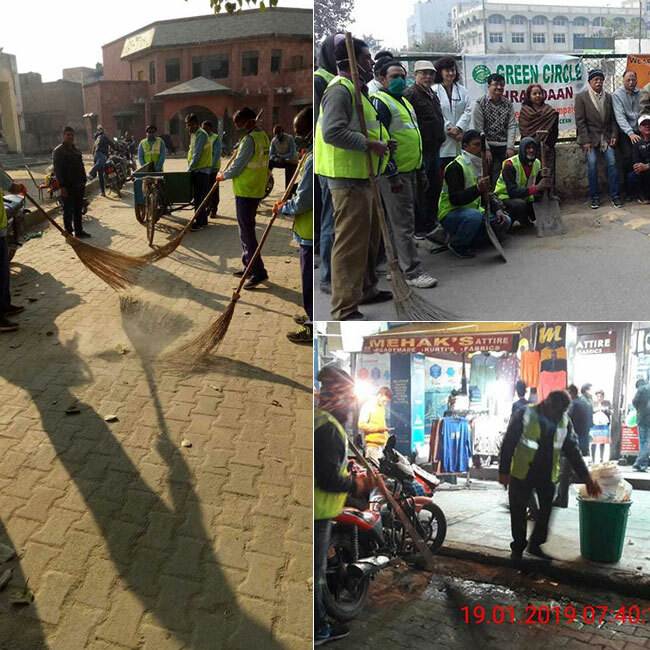 SDMC Mayor, Narendra Chawla led teams have been conducting time to time sanitation and awareness drives in their part of the city, in addition to keeping a check on the dirt and waste management. According to Mr. Chwala, to sustain cleanliness, it is very important for the citizens to be aware of the necessity of being Swachh, not only as a concept but as a habit. 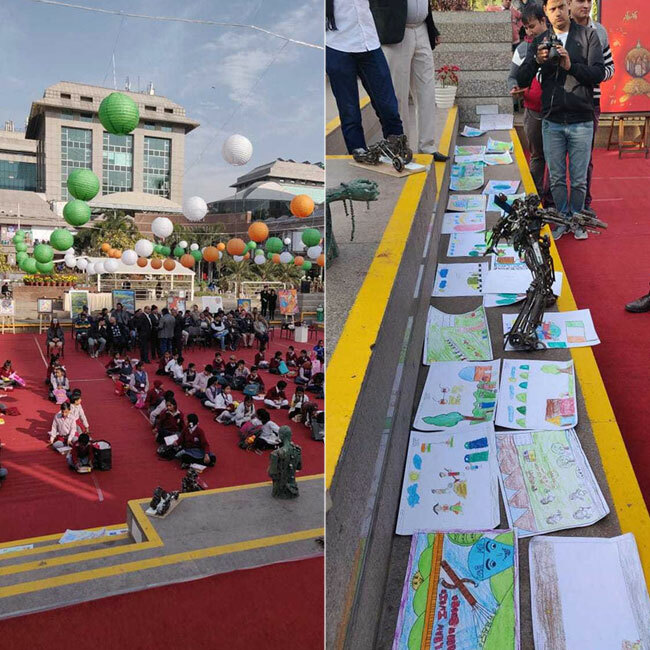 The mayor personally inaugurated a painting exhibition on the theme of ‘Swachhata’ at the Select City Walk Mall in Saket and has organised meetings with various Resident Welfare Associations in the region. 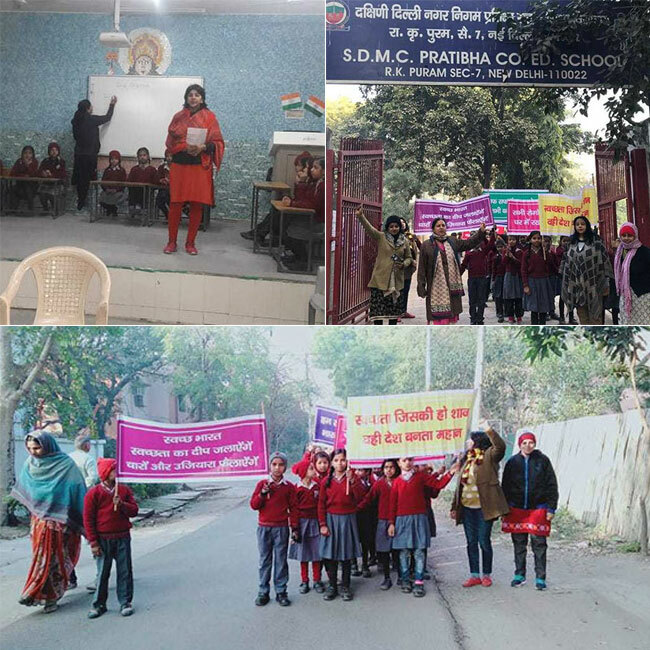 Quiz competitions on swachhta and children’s rally for promoting the message of swachhta was conducted in about 50 schools of SDMC. During these drives, the participants along with the residents pick up garbage from the parks, roads and bus-stops. The participants then create awareness about the segregation of waste at source and the problem of littering. Building a sustainable Delhi in all spheres will need participation and engagement of all stakeholders including the private sector and the civil society especially the poor and the marginalised, believes Mr. Narendra Chawala. 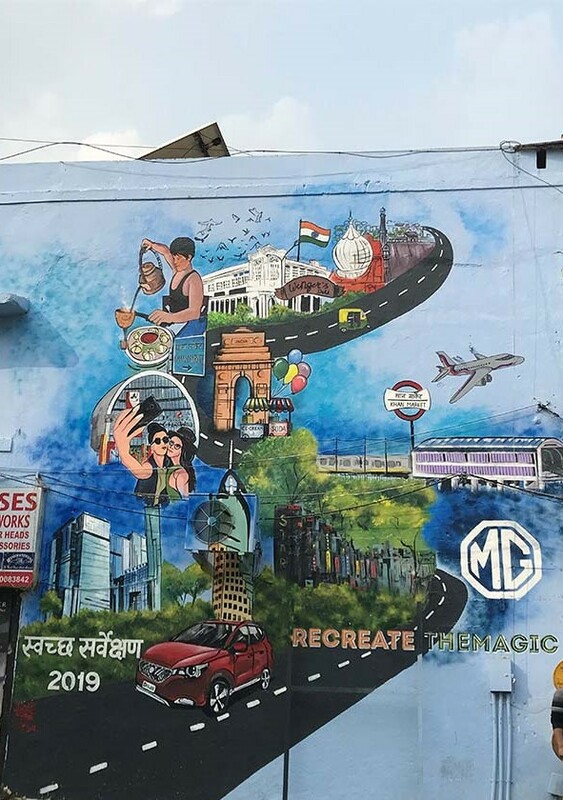 The New Delhi Municipal Corporation (NDMC) is the central part of the city with famous spots like India Gate, Connaught Place, Jantar Mantar among others. NDMC was ranked the cleanest small city in Swachh Survekshan 2018. 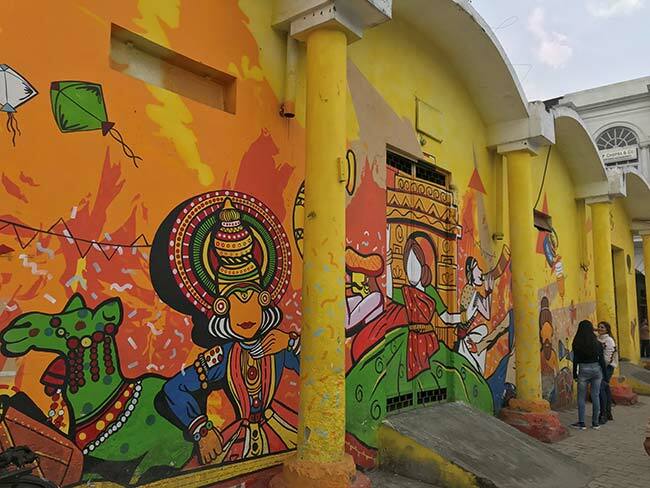 The area was also declared the cleanest in the north, based on its solid waste management, access to sanitation among other parameters of cleanliness, under the zone-wise Swachh Survekshan in 2017. This year, NDMC has left no stone unturned to ensure another year of good reviews. 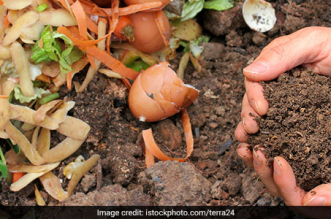 As part of the awareness campaigns, awareness drives are being conducted by the NDMC promoting issues like waste segregation and processing wet waste into manure through composting at home. 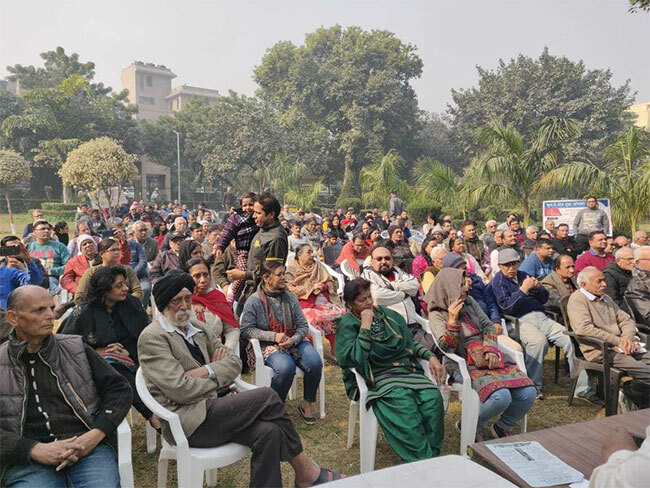 Nukkad Natak or street plays were also organised throughout NDMC to promote waste segregation, anti-littering measures and hazards of single-use plastic. 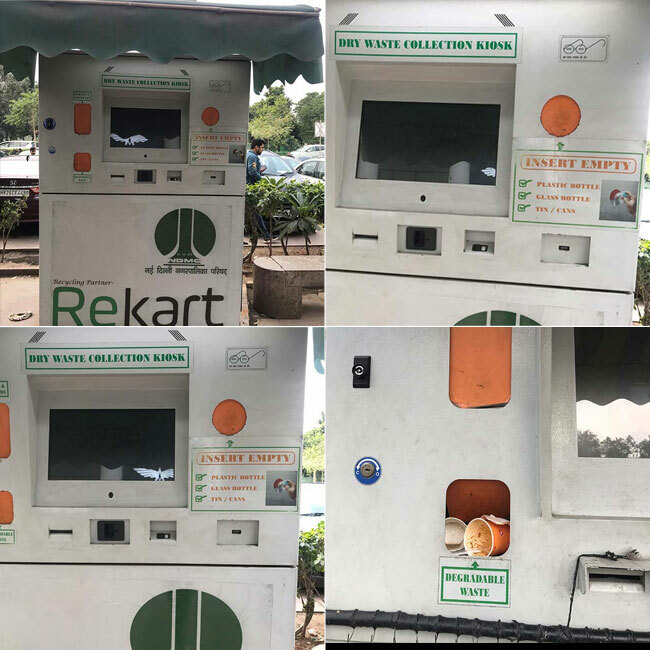 NDMC has also installed reverse vending machines throughout the area especially in the business and financial hub of the capital, Connaught Place. In these machines, unlike a regular vending machine, one has to insert dry waste like plastic bottles, plastic cups, straws, into the machine in exchange for restaurant and refreshment coupons. Beautification of the commercial areas like Connaught place and Khan Market has been accomplished with magnificent results. 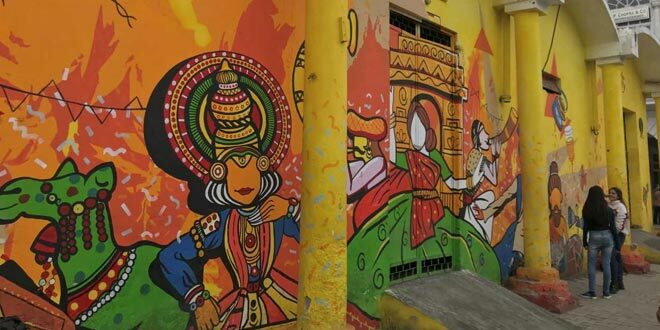 These graffiti are aimed at raising awareness about Swachh Survekshan and help maintain cleanliness. East Delhi Municipal Corporation (EDMC) secured 196th rank in the Swachh Survekshan in 2017 followed by an unsettling fall to 341st rank in the 2018 edition of the cleanliness survey. EDMC, taking this hit hard, has organised numerous training sessions and awareness drives. 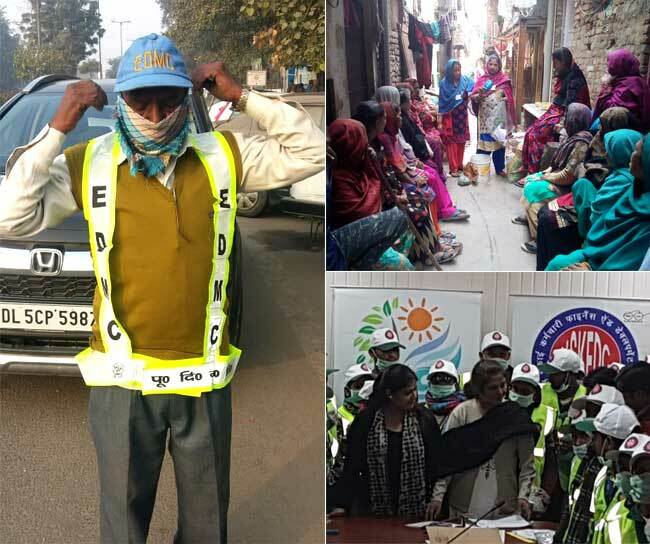 Safari Karamcharis have been provided with the safety gears and training sessions are being organised for the waste pickers in their zonal office in Karkardooma, Delhi. 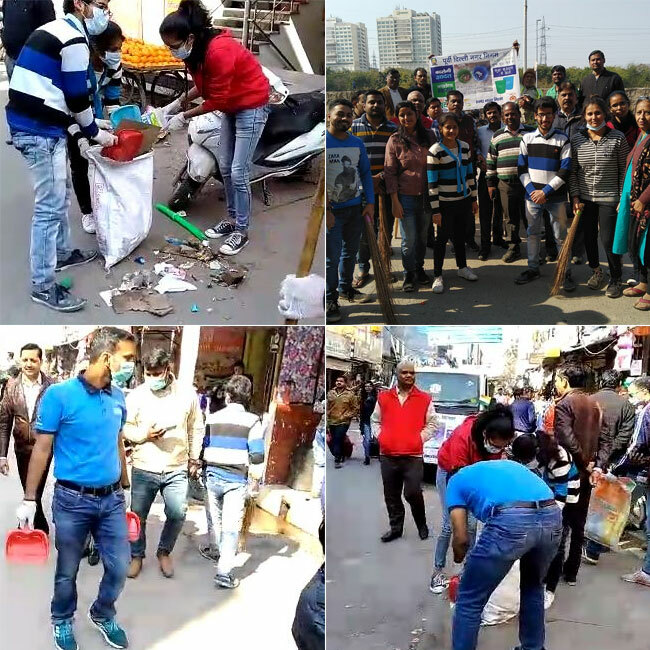 EDMC carried out cleanliness drive on the main road of New Ashok Nagar with the help of volunteers of the NGO, Environmentalist Foundation of India. 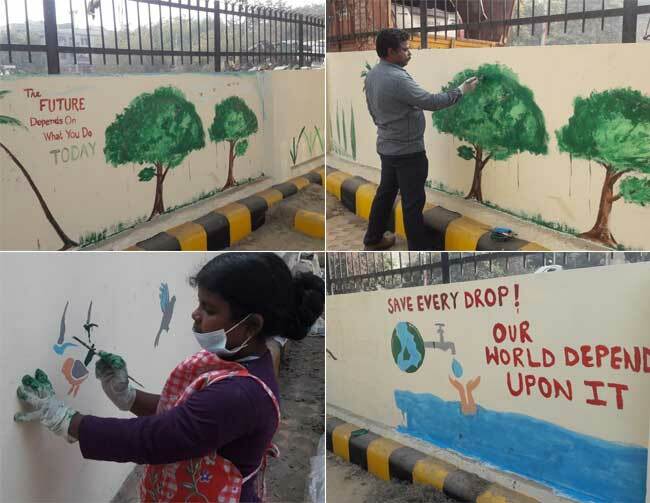 Beautification and cleaning of Public Park at Bahubali enclave in EDMC area with graffiti and wall arts promoting the message of tree plantation and water conservation. North Delhi Municipal Corporation is the local body for the northern zone of the national capital. The areas under north Delhi include the north campus of Delhi University and residential areas like Rohini, Pithampura, Model town to name a few. The local body has encouraged all active stakeholders to participate in the initiatives. Special awareness drives in school, markets and Resident Welfare Associations have been organised to promote waste segregation at source and hazardous impact of single-use plastic. Meetings were conducted by Zonal Deputy Commissioner with public representative, RWAs and helping groups. 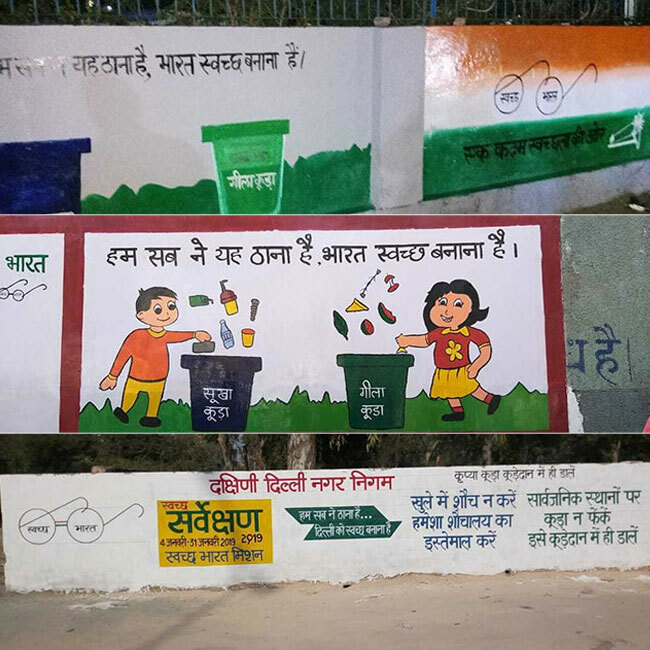 In terms of publicity to generate awareness, the local body has erected hoardings, posters and banners informing the citizens about North Delhi’s initiatives for Swachh Bharat Abhiyan and Swachh Survekshan. The local body has also created audio and print appeals by the Mayor, Aadesh Kumar Gupta along with radio jingles promoting cleanliness. 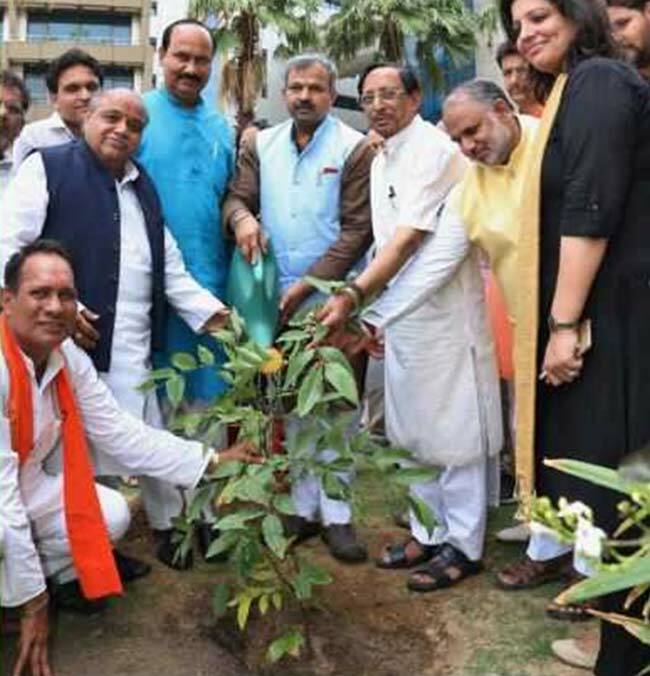 Nukkad Nataks or street plays were organised at various public places encouraging the citizens to practice waste segregation and plant trees. The best sanitation workers were also honoured with suitable awards at Zonal level. To motivate community groups to use community toilets, special campaigns were introduced, mostly in areas which do not have individual toilets. Special programmes called “Citi Bajao” and “Roko Toko” was undertaken to prevent the people from urinating and defecating in public. Both the campaigns include volunteers persuading and encouraging people found defecating or urinating in public to use a community or public toilet. Mr. Sushil Kumar, Olympic Silver Medal winning wrestler, was engaged as brand Ambassador who joined in public awareness programme under Swachh Bharat Mission launched by North DMC. Awareness programmes were conducted with presence of Sushil Kumar in schools, market places, public places among others.